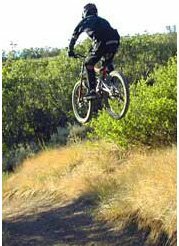 Cycling racing provides numerous excellent racing styles that require some sort of athletic performance. Motorcycling racing gives the thrills of riding at the edge of traction. Is there a place for a new electric bicycle road racing (EBRR) competition? EBRR should be addressed to cyclists who would have to master the technological aspect and the athletics aspect of electric bikes. EBRR should be adapted to the cycling culture and not the motorcycle culture. A fit person can produce 400 watts of power over a sustained period by pedaling. On the Tour De France they mentioned that some of the top level cyclists are able to pull 800-1000 watts of power for a short period of time. Therefore, the e-bike motor power cannot significantly exceed 800-1000 watts if we want to keep the muscles relevant and if we want to apply to the US law (more on this in the next paragraph), we better stick to even lower then this. EBRR would ideally face the cyclists with new racing styles. Most cyclists are not used to ride at speed larger then 30 mph, but aerodynamics and especially drafting consideration plays a crucial rules at high speeds and cyclists would need to adapt to it. As drafting becomes a dominant factor, riders will have more passing power. This means that EBRR will be very intense with a lot of chances for passing. Also, cyclists would have to know whether to use all motor power, kick another burst of pedal power or use both based on different consideration which are not taken into account today. Under the USA law, 750 watts e-bikes is considered as rgular bicycles and all that entails from it (Other nations have lower limits). EBRR bikes should somehow adapt to the law. In that way, everyone can still ride their bikes on the street. If we start a racing sport that makes the bikes illegal from the beginning it's going to limit it's usefulness. People wants something that is usable for there daily commute. Therefore, going with the laws is important. It's easy to measure the amount of power going into the motor but it is much harder to know what it's the output power. A typical motor is about 75% efficient. Hence, a 1000 watts of input power will give about 750 watts of output power, which resembles the top human achievable power. So, in that sense, 1000 watts of power limit make sense. This amount of motor power would not break the cycling mindset because all the things that are beneficial in cycling still hold truth. A constant motor power limit that is below or equal 1000 watts means that acceleration with the added power will be in proportion to the human applied power so pedaling retains it's significance. The most natural urge is to want to allow EBRR to use as much power in the motors as the designer can achieve. But, If you can increase motor power on an unlimited basis you will also need to increase battery capacity to feed this higher power level. More battery means more weight and that means a stronger frame and possibly suspension to make it usable. At some point the machine resembles a motorcycle only it retains "faux pedals" to satisfy the bicycle definition. An acronym PINO (Pedals In Name Only) describes this type of machine. Additionally, a precise power limiting and measurement equipment is a must in this case to ensure a fair race. Let's examine if limiting the maximum weight of the e-bike is a good solution. The weight is fixed so the rider weight dominates as the primary factor in acceleration. On a regular bicycle weight and human pedal power are naturally in balance as bigger riders can pedal more forcefully than smaller ones. So this rule causes an effect which is to select lighter weight racers. So EBRR can turn out to be a sport for kids and even rare small people. Some sort of relationship between motor power, body weight, and bike weight can make things fairer but we can end up having a system which is too complicated and no one will perceive it as being fair. Another approach is to set a limit on the battery capacity without regard to it's physical weight. Using regenerative braking while coasting into a corner could restore some energy back to the battery. Top speed would be determined by the wattage costs associated with pushing more air. Pedaling is very helpful to reduce wattage required to stay in motion, so the cyclist athletic performance is important. An important factor will the e-bike overall efficiency. It really is not just building a faster bike. You also gotta stay on it for a few laps. Battery capacity limitation will favor smoother and more tactical riding approach rather then full throttle whenever possible. EBRR needs to promote advanced technology, but should absolutely not focus solely about technology. The racing and competitiveness part can not be neglected. Otherwise, EBRR could turn out to be not so attractive. For summary, we have to make sure that every new style of racing is not PINO and that the e-bikes are mostly street legal. Different tracks requires different racing styles. Tight tracks will reward more frequent bursts of acceleration coming out of the turns while fast tracks will reward more time in a truck for faster top end speed. Electric bicycles speed is going to be higher then regular bicycles, but we have to make sure that the track is suitable for this higher speed. Otherwise, we risk cyclists to flying off the track and beyond safety barriers. What is the purpose of EBRR? One purpose of the EBRR is racing of course. But behind that, it should help to promote the electric bike industry as a whole. EBRR should deliver that e-bikes could be practical and also fun. Many people are not into racing at all but they are into electric bikes because the engine helps them...be it because of age, weight, hills, etc. EBRR should be addresses also to this kind of people in some manner. Currently, official EBRR competition is not held anywhere. It would be nice to see taking shape in the near future. This page is based primarily on the posts from the EBRR forum. Log on to it if you want to read further information or contribute some fresh ideas.